Crude prices remain overly cautious and seem to refresh their downside bias after Saudi Arabian oil production hit record highs in November. The Kingdom has reportedly hit at around 11.3M barrel per day and US Crude production similarly remains near all-time highs, and the steady oversupply across the globe is seeing broader energy markets firmly restrained. OPEC is expected to take further measures on December 6th, where production limits are expected to be the main topic of discussion. 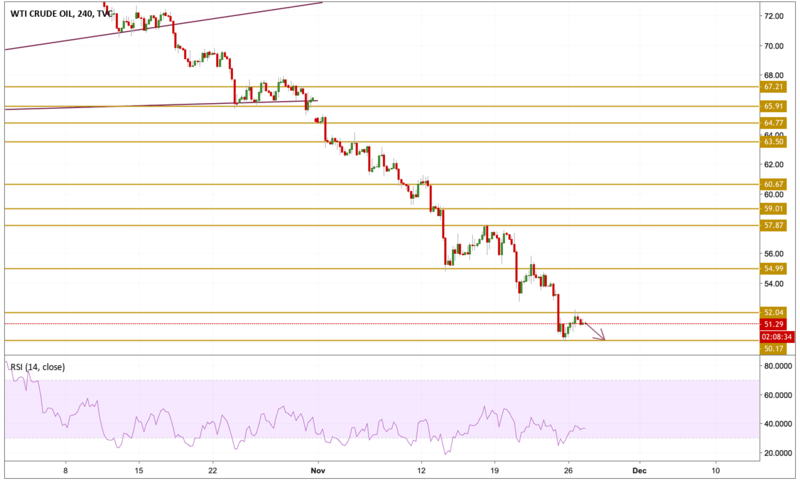 After a slow day, Crude oil selling interest has been renewed after attempting and failing to break above the $52.04 resistance level. We expect a retest of the recent lows as the momentum is still bearish. The level we will be watching is $50.17 support level.